It is possibly heretical to admit as much on such an ornithologically biased website, but one good snake can often be the highlight of my birding day. I will always take a few moments to check out a likely spot or follow the threat calls of birds in case a snake might be found. 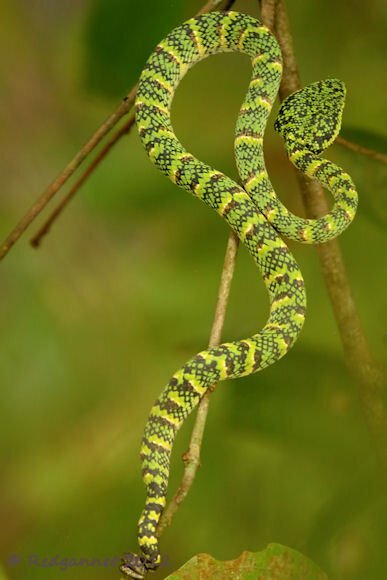 I was lucky enough to find a Wagler’s Pit Viper, Tropidolaemus wagleri in Singapore recently and it fair took my breath away. This specimen was only very small, perhaps 50cms, but a large female can reach up to a meter. A viewing tower with 6 storeys has been constructed in the rainforest in the Central Catchment Area of Singapore (Google Earth Coordinates; 1°21’4.72″N 103°48’22.92″E ) and the snake was seen between the second and third stages, so it was possible to view it from different angles. In trying to identify it, I learned that this species has many different patterns in a wide variety of colours. As seen here, the prehensile tail is a great asset to these arboreal snakes. 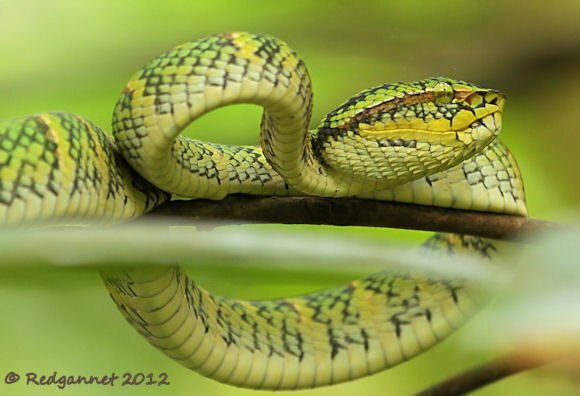 The “pit” in pit-viper refers to the temperature sensors that are situated just behind the nostrils. These can detect extremely small changes in temperature and help to locate prey during the darkest hours. 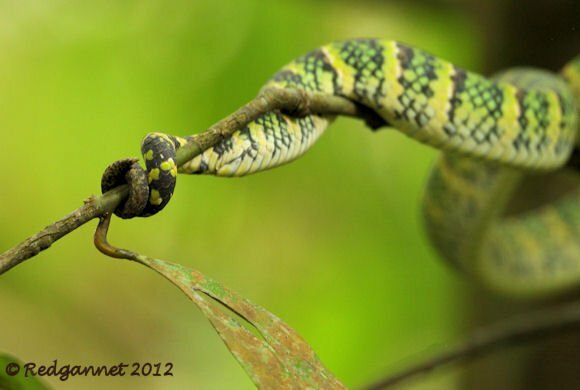 Wagler’s Pit Viper can be found all over South East Asia in primary and mature secondary forest, even in mangroves. They prefer warm, humid conditions which pretty much sums up Singapore’s climate. If you liked this post and want to see more great images of birds, mammals, reptiles and insects, make sure to check out 10,000 Clicks, our big (and growing) page of galleries here at 10,000 Birds. I hate snakes because they hate me! Imagine: 2 years in Namibia searching for mambas, cobras and puff adders. NONE. Only non-venomous species and a few almost harmless smaller adders. 3 weeks in Indonesia: no snake whatsoever – I really had hopes for a cobra there. It is like I m cursed to never encounter the big, fancy, scary snakes. So thanks for those amazing pics – they’re all I am ever likely to see! My preferred method of finding snakes is to almost stand on them. 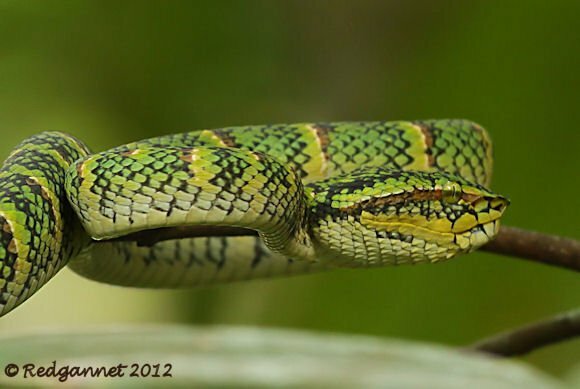 A tiny puff-adder in Kenya, a krait in Thailand, and most alarmingly a Rhinoceros Viper in Uganda. I don’t see them often, but when I do I usually almost kill/antagonise them by accident!